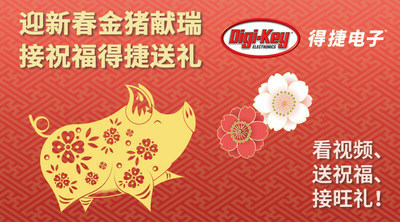 THIEF RIVER FALLS, Minn., Feb. 4, 2019 /PRNewswire/ -- Happy Lunar New Year of the Pig from Digi-Key Electronics! The global electronic components distributor wishes customers, suppliers, and partners a prosperous 2019 and gives thanks for a successful 2018 that helped the company reach a new milestone for the second year in a row with sales of over $3 billion worldwide. A sales record was set in Greater China with $260.2 million, up 50% from 2017.